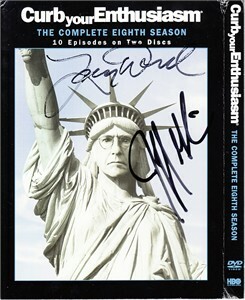 Curb Your Enthusiasm Season 8 DVD set autographed in black marker on the outer box by writer, creator and star Larry David (has very minor streaking from glossy surface) and co-star Jeff Garlin. DVDs are included but not autographed. With certificate of authenticity from AutographsForSale.com. ONLY ONE AVAILABLE FOR SALE.